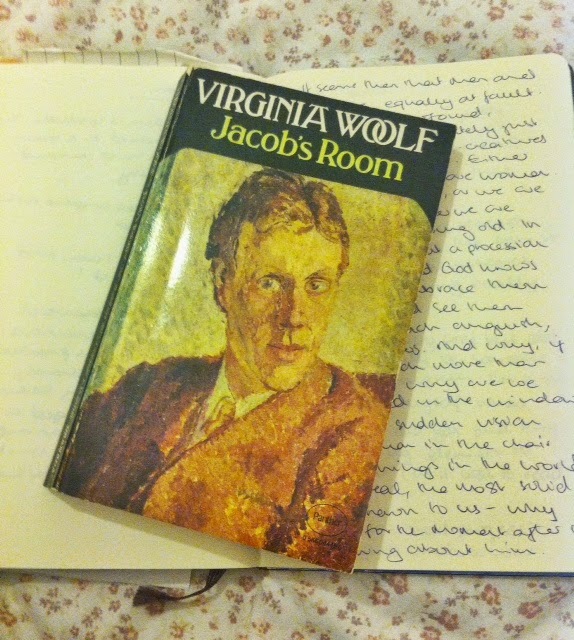 I was so tempted to title this post 'in which I realise that Woolf is not scary and is actually a babe'. That's basically the revelation I had a few pages into Jacob's Room. It's pretty hard to sum up this novel given that there is not really any plot to speak of. Basically it's made up of a number of impressions of Jacob Flanders from the people he encounters throughout his life. Oh, and it's really good. I've always had it in my head that Jacob's Room is a war novel. Perhaps because of Pat Barker's Toby's Room and the links there. This is, in a sense, a war novel because you can constantly feel it there rumbling below the surface, but if I was going to say this is a novel about 'something' I would have to say it's about identity. Specifically how a person's identity can be interpreted and constructed in many ways by outsiders and observers. Jacob's Room is made up of a series of impressions of Jacob as a man by the people surrounding him. Interestingly many of the people who are creating the different versions of Jacob, are in love with him in some way or another. There's something in that but I can't quite follow it through. I found this to be a particularly sombre read. Mostly because we never actually see Jacob from his own point of view. Throughout the entire novel we are never privy to Jacob as an individual, we only meet him as others see him. Which, to me, is pretty sobering as I'm such an unintentionally judgemental person. Here we're almost introduced to a world where no-one knows anyone else past their own impression of them, whether it's right or totally wrong. Um, hello world of social media. I think I have finally reached the point where I understand and can recognise Woolf's style and what makes her writing distinguishable. Not that I can put my finger on what it is, it's just a more general sense of what Woolf is all about. I could see parallels between Jacob's Room and Between the Acts and To the Lighthouse. I feel like they address similar topics in that they all concerned with upheaval and unrest as a result of war. Beyond that I can see how Jacob's Room (as her third novel) laid the foundations for those later works. Woolf's prose is quite emotive, even without crazy plot turns or overly emotional scenes. It feels a bit ridiculous to say something is emotive and then say there are no emotional scenes. That's where I've always had trouble with Woolf (on reflection). There is something powerful about her works, but it's so hard to pinpoint why and where it comes from that my tiny brain is blown every time. At least here I almost feel like I'm coming to grips with her impressionistic stream of consciousness writing. I've got a million thoughts rolling round in my head right now, but I'm not going to share them all because I don't want to confuse you as much as I do myself. What I really want to know is whether you have read Jacob's Room and if so, what you thought of it. Don't leave me hanging here, do you find Woolf a powerful, if confusing, writer? Mrs. Dalloway is the only Woolf I've read, and I loved it. I really like the way you describe the experience with her. I need to read more.